Wondering why your well pump is running non-stop? Let’s go into more detail about each of these 6 common well pump problems and how to solve them. Don’t want to try and troubleshoot the problem yourself? Give us a call. We’ll find and fix the problem. If you have an appliance like a toilet or sink that’s always running, your pump may also run non-stop. That’s because a running appliance demands a constant flow of water, which forces your pump to run constantly. Turn off the main water supply to your home. If your pump stops running after you shut off the main water supply, then it could mean one of your plumbing fixtures is demanding too much water. Turn the main water supply back on, then check plumbing fixtures like sinks, showers and toilets as well as outside garden hoses and lawn sprinklers to make sure they’re not running constantly or leaking. If you have any leaks or a constantly running appliance make sure you repair them (you may need a plumber’s help to do so). See if your well pump functions normally again after you fix any leaks. You can have 2 different types of pump systems: an above-ground jet pump system, or an underground submersible pump system. Loss of prime at the well pump is typically only an issue with a jet pump system. “Priming the pump” means that the intake pipe on a jet system must always be filled with water (primed) in order to generate enough suction to pull water out of the well and into the household water line. If your well pump loses prime, then it will run constantly. Generally, jet pumps lose prime when there’s a leak in the suction line. 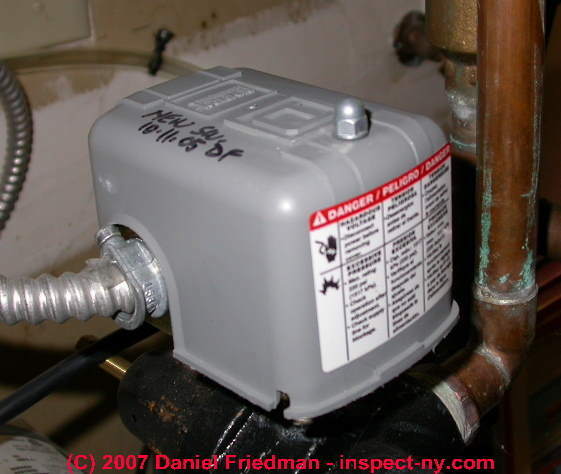 Solution: First, turn off the pump immediately in order to avoid damage to your pump. Running a pump that has lost prime can cause severe damage to the system. You can try to prime your jet well pump yourself, however, we recommend contacting a plumber because the suction line could have a leak, which a professional should replace. The pressure control switch regulates the pressure in your well pump. More specifically, the switch controls the water pressures that cause your pump to cut-in (turn on) and cut-out (turn off). If your pressure control switch is faulty (usually a result of clogged tubing or burned contact points), or if someone adjusted the cut-out pressure to be above the pump’s capacity, your pump will run non-stop. Solution: Contact a plumber to adjust the settings on your pressure control switch or replace it if it’s faulty. Adjusting your pump’s pressure settings often involves removing the cover from the switch, which is an electrical hazard (exposed live wires near water), so only a trained professional should handle this job. In order to function properly, your well pump needs a certain amount of water entering the pump at a regular pace. We call this the flow rate. If the water level has fallen too low, or the flow rate is off, then your well pump will continue to run without stopping. Solution: Contact a plumber to make sure your well pump system has proper water levels and the right flow rate. Your well pump is designed to shut off once it reaches a certain pressure. A significant leak anywhere in the well piping lowers the water pressure in the system. So if the pressure is too low, your pump won’t shut off and instead will continue running all the time. Solution: Contact a plumber to inspect your well pump system for leaks. A plumber will have the right tools to find and repair any leaks. As will all mechanical equipment, well pumps can give out over time. If a well pump has internal mechanical damage, it won’t raise water pressure to the control switch cut-off point which will make the pump run non-stop. Solution: Contact a plumber to repair (or likely replace) your well pump. Need a reliable plumber to fix your well pump? Contact Aztec Plumbing & Drains to schedule a well pump repair. We’ll send one of our trusted plumbers to fix whatever is causing the problem so your well pump will turn off and run properly.